Austin was born with a rare genetic syndrome that manifested in Bilateral Microtia and Aural Atresia. In layman's terms, this means he does not have outer ears or ear canals. During his newborn hearing screening he both passed and failed the test, twice. Now most people might think, why even test him? He has no ears, so of course he can't hear. I'm here to tell you that that line of reasoning simply isn't true. I knew it was possible for him to hear before they even tested him, but of course there was also the chance that he would be deaf. What most people don't realize is that there is more than one way to hear. What surprised me most is the lack of knowledge that most doctors had on the subject. Within 24 hours I had more than one doctor say things like his missing ears are just "cosmetic," and he can get a cochlear implant and be good as new. While I'm on the subject, I'd like to take a moment to dispel another common misconception. Not all people who are deaf or hearing impaired are candidates for a cochlear implant. While Austin does not have ears, he does, however, have perfectly functioning cochlea. Therefore, he did not need a cochlear implant. What he needed was a Bone Conduction Hearing Aid. There is a lot of biology that goes into the entire subject, so you'll just have to make do with a quick lesson on different methods of hearing. For those with ears, sound is conducted by air. Air flows into the ear canal, passes the middle ear bones, and the vibration of the air sends signals to be processed by the cochlea. From there, the signal is sent to the brain where the sound is recognized. For those without ears, sound is conducted by vibration alone. We cut out the middleman and get directly to the part where the bones send vibration signals to the cochlea and brain for recognition. For a person who is deaf from sensorineural hearing loss (with or without ears), often the cochlea does not receive the signals, and the brain is unable to recognize sound. 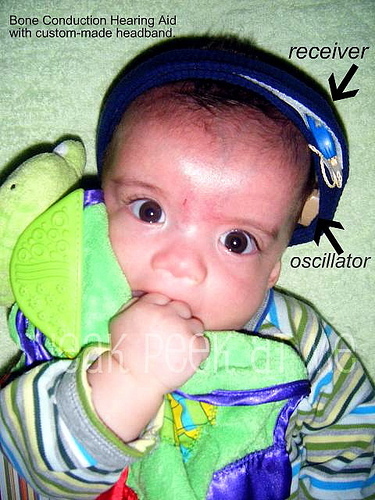 Thus enters the possible need for a cochlear implant to hear. I hope that that rudimentary explanation makes some sense about how it is possible to "hear" even in the absence of ears and ear canals. 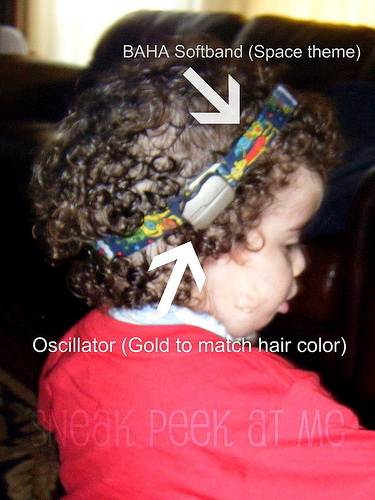 A person with Microtia like my son needs vibration to hear, and therefore needs a different type of hearing device than a cochlear implant. They use a device called a Bone Conduction Aid, with a receiver that takes sound and creates a vibration on the skull. Voila! Hearing. After extensive testing at the age of three months, the conclusion was Austin CAN hear without a bone conduction hearing aid at about a level of 70-80dB, which is considered a severe hearing loss. What that means is he can hear a dog bark or a piano if they are basically in the same room as he is. He can hear us talking if we are REALLY SUPER LOUD and close to him. Believe it or not, at the time this was good news. When tested with a Bone Conduction device, his hearing improved to about a 40-45dB level, which moved him up to a moderate hearing loss. Since the sounds of speech fall at about 25-55dB level, it was obvious that he would get some benefit from a Bone Conduction Hearing Aid. As often happens, hearing aids were not a covered benefit of our private insurance. The recommended hearing aid, a BAHA or Bone Attached Hearing Aid, cost nearly $4000. This was not even remotely possible financially so we settled for a Traditional Bone Conduction Hearing Aid, which had a more feasible cost of $1200. This hearing aid has two parts, a receiver for sound that works much like a traditional behind-the-ear hearing aid, and an oscillator that rests on a headband against the skull and sends vibrations. The BAHA, as its name suggests, is instead one piece of equipment (a receiver/oscillator) that is attached directly to the skull behind the ear. However until age five, a BAHA is also worn on a headband, called a Softband. Six weeks later, Austin wore his hearing aid and heard my voice for the very first time. He was four months old. It opened up a whole new world of sound to him. From the moment I first turned it on he was amazed! Overall, he adjusted well to hearing sound, and we quickly discovered he liked music a lot. We moved from Texas to California in August 2008. With new doctors, new insurance and some great help from audiologists at the John Tracy Clinic, Austin finally was able to receive a BAHA Softband. He wore it for the first time on April 18, 2009. What a great day!! With his BAHA, Austin is hearing at about 25-30dB, aided. That's normal hearing range! So far our experience has been idyllic. In fact, the only difficult thing has been explaining it to others. "What's that?" is a question we get a lot from both strangers and professionals in the medical field alike. It's not a very common type of hearing device, so I find myself constantly saying, "No, it's not a girly headband. No, it's not a cochlear implant." From the beginning, "The Plan" has basically remained the same. Austin will be encouraged to communicate verbally and through Sign Language. Since he also has a tracheostomy, it was obvious that it would somewhat hinder his physical ability to produce speech, as traditionally air does not hit your vocal cords when you have a trach. So, in the meantime we needed some signs so we could communicate. While he was hearing, we were also teaching him American Sign Language. At 18 months Austin had about 70 signs that he used with regularity. Today he probably has 200 signs and he can vocalize with each one. While his speech has improved over the past year, he is still far behind his peers. So now begins the second phase. Austin needs a second BAHA. It makes sense to me that Bilateral Microtia equals bilateral BAHA, to compensate for his not having two outer ears or ear canals. It seems simple enough, but of course the insurance company acts as though I am being greedy wanting my child to have one "ear" for each side of his head. I'm not sorry I actually want my son to hear to his full potential and to speak clearly, too. If that's Greed, then I'm Guilty!! Janis chronicles her son's life and medical journey at Sneak Peek At Me. She is a special needs advocate for children who are medically fragile and families with a rare disease diagnosis. Copyright 2010 Complex Child E-Magazine. All Rights Reserved.